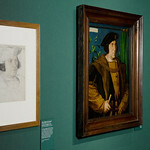 This set contains images from The Queen’s Gallery, Buckingham Palace where works by the greatest artists of the northern Renaissance are on display inThe Northern Renaissance: Dürer to Holbein (from Friday, 2 November 2012 until 14 April 2013). The northern Renaissance in Europe was a period of fascinating change. The artistic influence of Italy, the rise of humanism, the availability of the printed word, and a decline in the power of the Catholic church were all reflected in the art of the period. The exhibition brings together almost 140 paintings, drawings, prints, manuscripts, sculpture, tapestries and armour and includes works by artists such as Albrecht Dürer, Hans Holbein the Younger, Lucas Cranach the Elder and François Clouet.